Developed as an alternative to full ADA compliant restrooms, the Liberty is a spacious, wheelchair accessible restroom that can also be promoted as a family-sized restroom. It has a patented flat-floor system for easy wheelchair access and maneuverability. The handrails and paper holder, together with the rotary latch, are designed and manufactured for simple end-user operation. 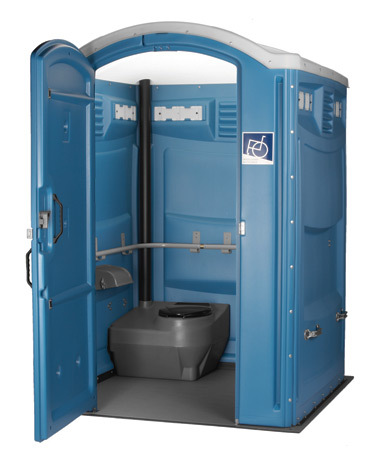 Operators have the distinct advantage of owning a restroom made from high molecular weight polyethylene that is durable and vandal resistance. The entire door frame, which is made of a vacuum formed twin sheet, is able to withstand hard hits and endless pounding without bending or buckling like metal frames. The patented flat floor system, combined with the strength of the side walls and capped roof, forms a sleek, modern restroom that retains its shape over the life of the product.